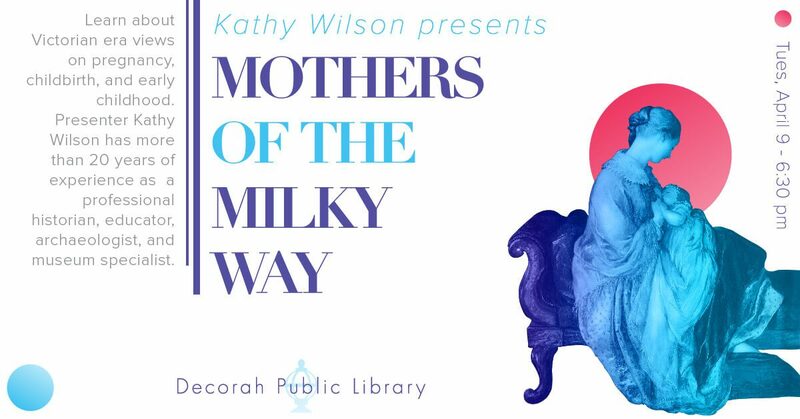 Back by popular demand, historian Kathy Wilson will speak at the Decorah Public Library on Tuesday, April 9 at 6:30 p.m. Wilson’s talk “Mothers of the Milky Way” addresses the lives of Victorian era women and the subjects of pregnancy, childbirth, and early childhood. Were Victorian women really as clueless about intimacy when they married as we’ve been told? What did they know about pregnancy before it happened? Learn the answers to these questions and others in a fascinating look at pregnancy, childbirth, and childhood in the 19th century. Presenter Kathy Wilson has more than 20 years of experience as a professional historian, educator, archaeologist, and museum specialist in the Midwest and Southeastern United States. She has a BA in History from Bemidji State University, a Masters from the University of York (England), and is a PhD candidate at the University of Iowa. For more information, contact Carmen at the Decorah Public Library at 563-382-3717.